When Saratoga and its citizens worked together to preserve the city's historic landmarks. Imagine standing in front of today’s Visitor Center and looking towards the Arts Council building. In 1911, you would have seen the Congress Hall Hotel. Editor’s note: As the Saratoga Springs Preservation Foundation celebrates its 40th anniversary, Saratoga Living looks back at how the city and its citizens worked together to preserve Saratoga’s rich heritage and restore its historic landmarks. In 1917, sculptor Daniel Chester French returned to visit Saratoga and his 1915 masterwork, The Spirit of Life. 100 years later, we revisit the 2015 Trask Memorial Restoration Project with new perspectives. Aiming to become “the most beautiful spot on the continent,” the village hired eminent landscape architect Charles Warren Leavitt, Jr. in 1912 to map out a landscaping plan for the new and larger Congress Park. The hotel had a sunken rear courtyard in which grew several tall elms. 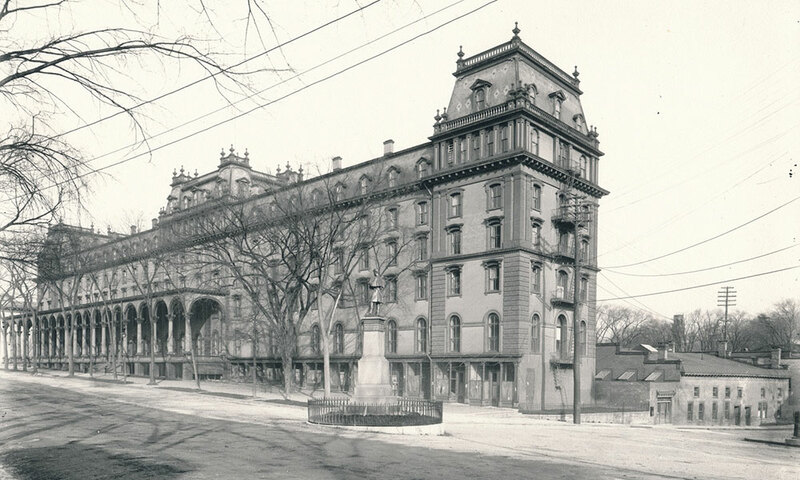 It was Leavitt’s idea to try “to make the most of the natural advantages, the different levels and retaining walls of the Hotel, the trees now in centre court.” In early 1913, three years after Spencer Trask was killed in a train accident, George F. Peabody and Katrina Trask chose a team consisting of sculptor Daniel Chester French and architect Henry Bacon for the Spencer Trask Memorial, by then planned for that northwest park corner. French, Bacon and Leavitt approached the rocky lot as a blank canvas. “They gave us this entirely unimproved plot of ground and permitted [us] to treat it as we saw fit,” French happily recounted; “I flatter myself that the result is sufficient indication of this way of doing things.” The street and lower courtyard levels of the Hotel became the two levels of the Memorial; the courtyard elms remained. It would be August 30, 1913, before the village legally took possession of the parcel for $50,000 less $25,000 in back taxes. The land appeared deceptively clean, for once Security Steel had taken the Hotel down to piles of debris, the village allowed all remaining waste material to be dumped into the cellars. 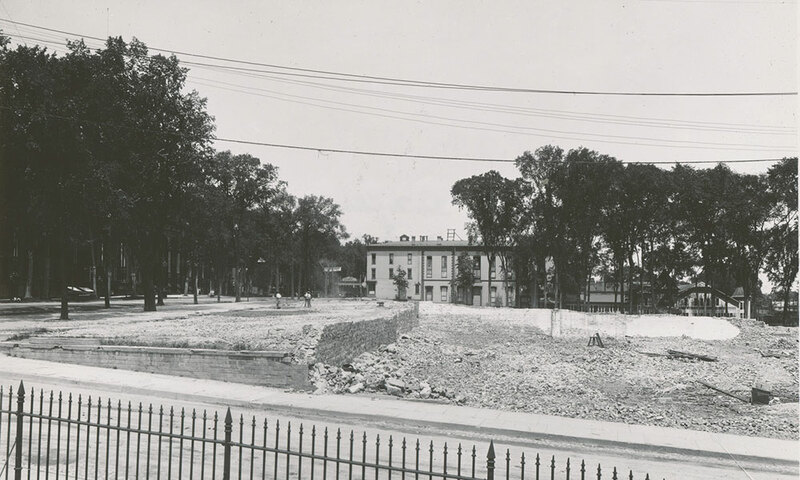 View of the rubble of Congress Hall in the summer of 1913, looking north from the Congress Spring. Note remnants of the hotel’s rear walls. A 1914 view of the Trask Memorial, completed except for The Spirit of Life. Leavitt saved the mature elms, visible in the foreground, from the Congress Hall courtyard. 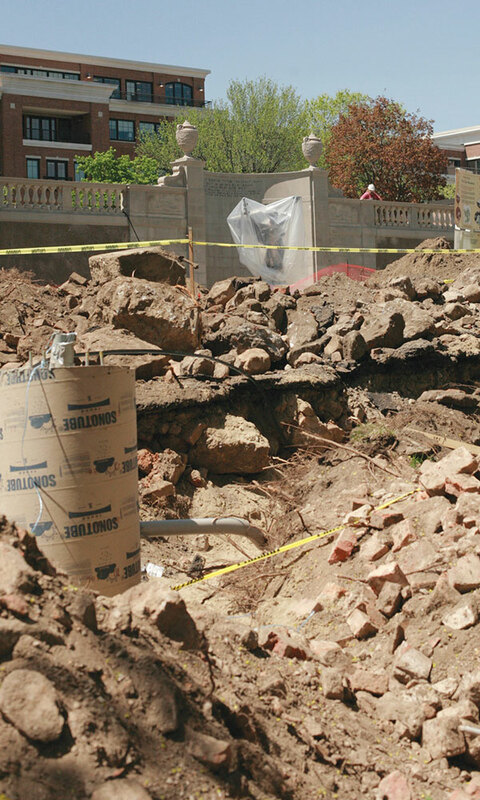 In 2015, truckloads of stones and bricks from Congress Hall had to be removed in order to set vertical concrete lamppost bases like this one (front left) on the path near the Casino pond. Beyond, The Spirit of Life is wrapped in protective plastic. The idea for the Trask Memorial Restoration first arose in 2010 out of concern for the safety of the memorial under its aging white pines. Samantha Bosshart, executive director of the Saratoga Preservation Foundation, recalls that the scope of the project expanded when “[landscape architect] Martha Lyon’s research showed that Leavitt’s plan was for that whole northwest quadrant.” Martha recalls the complexity of working with Leavitt’s original map, found hidden in City Hall, as “some of the plant species do not exist today… [while] other plant species are invasive and best practice does not condone use of them.” Additionally, several unusual trees near the memorial had been donated to the park by local citizens over the past twenty years: a juneberry, Kentucky yellowwood, star magnolia, eastern redbud, flowering dogwood, purple weeping beech, and Kentucky coffee tree. Most donated trees are given in memoriam; forester Rick Fenton helps to choose and artfully plant these sentimental reminders across the park landscape. Martha kindly incorporated them into the restoration plan. 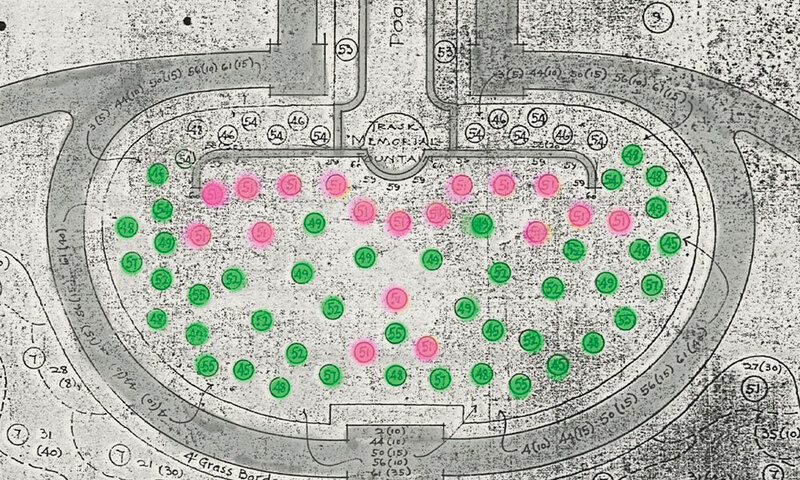 Detail of Charles W. Leavitt’s “Plantings Plan for Congress Hall Park” dated May 5, 1914, showing the oval above the Trask Memorial pool with all evergreen trees highlighted in green except for white pines, which are highlighted in pink. In Leavitt’s day, mature elms formed most of the tree-scape of the park. 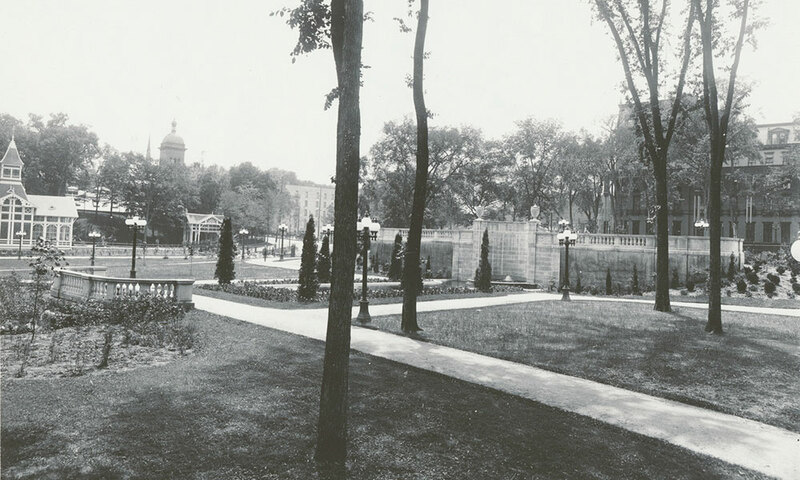 Elms lined Broadway and Spring Street; a curved row of elms dotted along the brook in front of the Casino; elms encircled the large lawn below the Congress Spring. Their limbless lower trunks and high sprays of curved leafy branches shaded the pond beyond Deer Park Spring so distinctly that it was called “The Shadowing Pool” in Katrina’s memorabilia. Leavitt, French and Bacon planned a radical departure for the tree-scape on the upper level of the Trask Memorial: 59 evergreen trees, spaced irregularly across the oval between the paths. Forty-seven of these trees would mature to 50+ feet: white, Austrian, and scotch pines; blue spruce, and hemlock. The remaining 12 cedars and arborvitae would reach around 25 feet. Eighteen white pines, nearly a third of the total, made a solid row along the top of the masonry wall, thus forming the statue’s visual backdrop. As beautiful and welcoming as is today’s open landscape, this very different historic plan, a “combined effort” of the three designers, is worthy of note — especially in its display of the many-layered ideals cherished by the Ladye of Yaddo, as Katrina Trask was affectionately known. The quest to understand this pocket-sized forest in the heart of downtown Saratoga requires a trip back in time, out Union Avenue to the great Yaddo estate.